Do you have penchant for travel? Perhaps you’ve spent a year or two travelling the world, embarking on the adventures of your dreams? You may be planning an incredible honeymoon to lands afar or you might be planning the wedding of the year in warmer climates… if this sounds like you and your partner in love, this invitation could be just the ticket! The Love Travel is perfect for those of you who, well, love to travel! Designed in a card-style format, this invitation from Ditsy Chic, is fuss free and oh-so-easy to send to your guests. 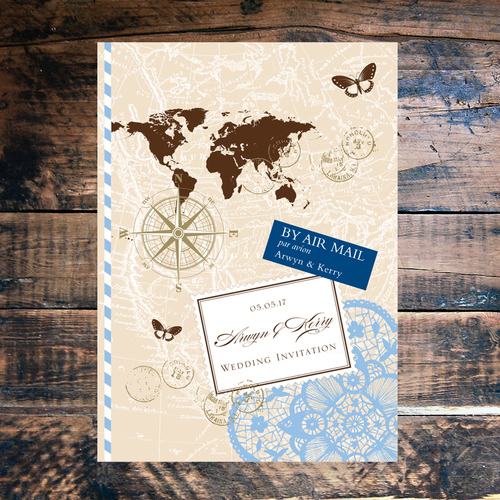 Taking inspiration from the world map, the Love Travel design features an Air Mail stamp both on the front and the inside of the invite, fully personalised with the Bride and Groom’s names. The front of the invite also boasts a gold compass, two pretty butterflies, a beautiful lace-inspired pattern and an array of vintage hand stamps. The wedding date, your names and the words ‘Wedding Invitation’ will be perfectly printed in your very own stamp which takes centre stage amongst the other delights. The vintage feel really makes this design stand out and if you mix this with the hints of your chosen colour, you’ve got a cracking little versatile design indeed! To ensure super quality, these 12.8cm x 17.8cm invitations have been digitally printed… you wouldn’t know that they have been produced from 100% ECF fibre (sourced from sustainable forests) would you? Beautiful and kind to the environment – we like that! So whether you’re jetting off to New York, Thailand, Antartica or the Seychelles, entice and tease your guests with these inspiring invitations! Tags: Airmail, Sustainable Forests, Vintage Travel.